The state’s highest court Monday said a $3.6 million dollar bond to expand Paulding Northwest Atlanta Airport’s taxiway is valid, the latest development in a legal battle over the airport’s expansion plans. “I think the biggest hurdle in a project like this is getting the money, and at least so far, they’ve been cleared legally to go forward and to issue the bonds and to raise the money they’re going to need to complete the project,” said WABE Legal Analyst Page Pate. Paulding County last year approved the bonds to pay for a controversial airport expansion that would include commercial airline service. Along with strong opposition from Atlanta-based Delta Airlines and the City of Atlanta, Paulding’s move prompted a suit from some county residents, who argued the bonds were unconstitutional. In the suit, the residents raised issues of secrecy surrounding the bond validation. They also argued financing would wrongly benefit a private provider. The court Monday dismissed those challenges, saying the validation and financing were sound. 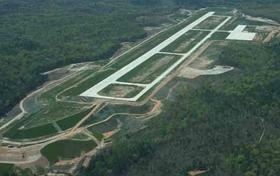 Paulding Northwest Atlanta Airport director Black Swafford said the court’s ruling puts expansion plans back on track. “This really makes us whole, puts us back where we should have been back in December with utilizing the bonds to pay for the construction. But Pate said Monday’s ruling is important for the airport. Plans for the airport still face two other lawsuits, brought by the same residents who filed the bond intervention suit. A formal environmental assessment by the Federal Aviation Administration also needs to be completed, part of an agreement that settled yet another lawsuit. Last week, the city of Atlanta also threatened legal action against Paulding, saying commercialization is a threat to Harstfield-Jackson International Airport.